My son Leonardo was diagnosed with Autism when he was 3 years old. Till then, our financial situation and lack of medical insurance never allowed us to provide him with the necessary treatment. Since he started to receive his therapies, we are very happy tosee the progress he has made. He is beginning to communicate with short phrases, follows simple instructions and has been able to start going to the bathroom and dress by himself. He has also been able to interact a little bit more with his friends. Although we see his progress, we are very conscious we need to work everyday to maintain it or he will regress again. Leonardo still needs to work very hard with his therapy in order to improve his concentration, increase his development, attain milestones and also manage his frustrations. 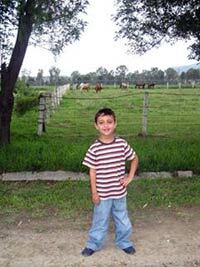 He is a very happy boy who loves music and likes to paint and play with sand or creams. Thank you Act4Me for giving my son a chance, and for all the help you are giving to my little angel. On March 30, 1999 our little Angel Cecilia was born, extremely premature, to change the lives of many humans that have helped her be who she is today and who she will become in the future. She had to learn to fight before she even took her first breath; Her battle through multiple sicknesses and never ending surgeries started, and hasn’t stopped since… At first, she met the requirements for the Early Intervention Program and was able to receive all she needed. When she turned 3 and the program came to an end, our health insurance did not cover Speech Therapy, the most needed for Cecilia. We started to self-pay because we could see the progress she was making but could no longer afford it after a few sessions. Cecilia’s progress, developmental milestones and possibilities of becoming independent had been hindered by the health insurance industry that does not understand our needs. How do we expect children that are Trainable Mentally Handicap to be able to function, at least partially, without the help of therapy, in today’s complicated world? Today, Cecilia is 11 years old, with a desire to conquer the world. Please open your hearts, open your eyes, and help us fight to help these children have the rights they deserve to have a better life tomorrow. Act4Me assisted us during a time that I was going through a sudden near devastating illness. We wanted to thank you for the support given to us for our son David. Since early in life, he always faced challenges. In elementary, David was slower than his peers and had difficulty learning. His peers isolated and ridiculed him, as a result. He continued to struggle and became very reserved, experiencing difficulty expressing himself to others. He is humble and loving, never complaining about anything. He always sees the good in others and deserves a chance to learn how to express himself socially, to better his ability developing relationships. My dream is to spread the word to many individuals that Act4Me is a note worthy cause… because I sincerely believe improving the quality of life for children with incurable diseases through a chance for therapy would make the difference in many lives. Thank you Act4Me… for making a difference in ours! Our son Jack was diagnosed with autism when he turned two years old. At about a year and a half, we noticed he had absolutely no type of communication whatsoever with the family and brought him to a center to have him tested. Because of his early age, he was able to qualify through our insurance plan, for what is called “early intervention services”, in other words, all kinds of therapy services until a child reaches three years of age. Unfortunately, by the time Jack turned 3, just about a year and a half into therapy, he was just beginning to learn how to deal and make progress with his numerous issues, such as feeding, developmental, speech, and communication. I think it is unbelievable that parents need to make a choice between their child developing like any other human being or being able to pay for the needs of their family. It is really a hardship on us, to have to mortgage our credit cards, get into whatever debt we need to get into, in order to be able to pay for thousands of dollars a year for therapy. In our economic climate, we need a lot of help, as these special need kids truly benefit and make obvious progress with therapy. They are regressing and loosing the skills they had worked so hard to reach. This is not right, this is not human. We need the help of everyone and hope this reaches as many people as we can. I was referred by the CCDH Program to contact you and apply for a speech therapy grant. I am a single mother, my daughter’s name is Priscilla Gonzalez. She is 10 years old, and she is a special child who needs speech therapy. 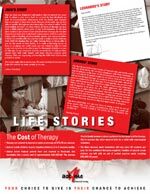 Through the years, it has been very difficult for me to get the therapies that my daughter needs because the medical insurance does not cover that type of therapy. I cannot afford to pay for them myself. Usually, after a session of therapy, there is a one year waiting period, and after that year, it is necessary to go on a waiting list, which could take for one, two, or more years to get another opportunity. Now, with the financial crisis, the local government has cut on many programs that used to offer therapy for special children. I greatly appreciate that I was able to get speech therapy for my daughter through the Act4Me program. I would like to thank you and your staff for helping my daughter through the program to have a better opportunity in life. 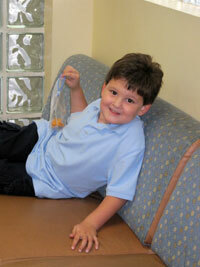 Sebastian is a vibrant, happy 3 years old with Cerebral Palsy. Within the first few weeks after birth, he suffered a grade 4 bleed in both ventricles of the brain that required brain surgery. The medical staff then told us that Sebastian might never speak, walk or be functional. He has proved them wrong in many aspects. Sebastian wants to do everything. Despite and since his past seven surgeries, he has been taking Physical, Occupational and Speech therapies 3 times a week. He now has a walker that helps him move around, and took over seven months to get approved by our insurance. We have since been fighting payment of injections that could improve the plasticity in his legs, to help him learn how to walk. Gifts are taken for granted every day, but Sebastian will not allow us to accept this, because every day he has, and everything he does is a gift. He is a fighter that refuses to quit.